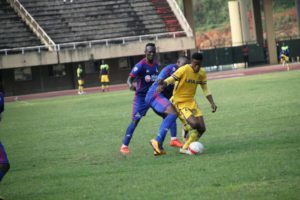 Saidi Kyeyune (right) tries to beat two Vipers players at Namboole. 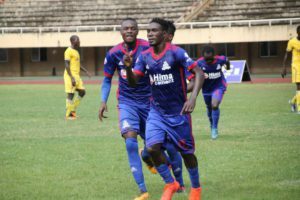 Vipers Sports Club moved to within four points of the league summit thanks to a 1-0 victory over sleeping giants URA FC at Namboole. The all-important solo goal was scored by striker Erisa Ssekisambu in the first half of the encounter. The game started slowly as both side looked to give one another maximum respect with most of the possession taking place in the middle of the pitch. However, four minutes to the interval, Vipers SC were awarded a penalty after a foul on forward Milton Karisa inside the box. Erisa Ssekisambu stepped up to convert the spot, sending URA FC goalkeeper Alionzi Nafian the wrong way to give Venoms the lead. Despite URA making a late surge to try and grab an equaliser, Vipers stood firm and ensured three points and a clean sheet are bagged. “Some time you have to suffer to get what you want and that is exactly what happened to us today but am proud that we came out victorious. We are now second in the log and we will try to do our best so as we win the league,” Duarte said. Asked about the return to fitness of star defender Halid Lwaliwa who has been out for close to a year, Duarte had this to say: “It is good news that Halid (Lwaliwa) is coming back for us at such a crucial time in the season. We had up to nine players missing in the last game against Maroons and it hurt us dearly but now that most have returned, it gives us more options to compete ably. The Venoms moved second on table with 39 points in 20 games. URA remained 9th on the log with 26 points from 21 games. Other matches played on Wednesday in the Azam Uganda premier league. Erisa Ssekisambu (infront) celebrates after converting the penalty in the 1-0 win over URA.